"Ironically, this book in praise of books first appeared as a much-praised iPad app and Academy Award–winning animated short film. 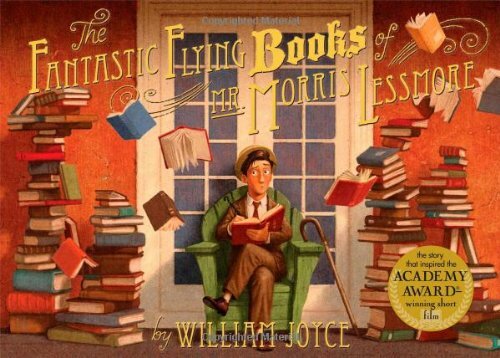 The story, in a nutshell, concerns the titular book-loving Mr. Morris Lessmore, whose personal library is blown away in a terrible wind but who finds meaning caring for the books he finds in a marvelous library. Filled with both literary (Shakespeare, Humpty-Dumpty) and film references (The Wizard of Oz, The Red Balloon and Buster Keaton), the picture book version of Joyce's story has a quiet contemplative charm that demonstrates the continuing allure of the printed page. Paradoxically, the animated books of the film and app are captured as though in a series of frozen frames. The motif of the bound, printed book is everywhere. Even the furnishings and architectural details of the old-fashioned library in which the books “nest” like flying birds recall the codex. The unifying metaphor of life as story is a powerful one, as is the theme of the transformative power of books. The emphasis on connecting readers and books and the care of books pays homage to librarianship. Rich in allusions (“Less is More”) and brilliant in depicting the passage of time (images conflate times of day, seasons and years), Joyce’s work will inspire contemplation of the power of the book in its many forms. As triumphant in book form as in animated and interactive ones." Illustration in this book is out of this world exceptional. As soon as I store it in the store I wanted my own copy. It was in it's own class among the other books in Chapters. The story line is brilliant. You can tell Mr. Morris is going to be an emotional story and then things get brighter and the illustrations enhances the story. As you read, it feels like the story is aging, only because the character is aging and you are drawn into the story too. It ends as it begins. This is another collection to add to your library. I felt it was geared for kids a bit older than preschoolers though. Grades 1 - 3. A beautiful book from cover to cover. On the serious side of things than humorous. Uplifting at the end though but the mood kinda stays on the same level and even when the colors bring new life, you can almost feel the slight change in your own mood but generally not a yay' feeling (like I said more of a serious book I thought/felt).